Ready to learn more about what Twitter is or how it can be used to improve your students' social presence in your online class? Join me for a free 30-minute webinar this Friday, June 7th at 9am Pacific/11am Central/12pm Eastern. Increasing student-student interaction in an online class makes learning more social, interactive, and relevant. While there are many ways to foster interaction within a learning management system, today’s social media tools provide new ways to engage students from anywhere at any time with mobile devices. This 30-minute webinar will examine how social media opens new opportunities for reflection and inquiry and present options to get started with using Twitter in your class to increase participation. Yes, it will be archived and viewable on the Faculty eCommons. 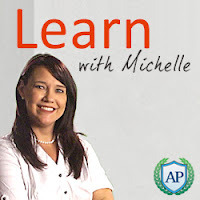 To receive news of future Learn with Michelle events, follow the Faculty eCommons on Twitter @APCommons or sign up for the newsletter at www.facultyecommons.org.